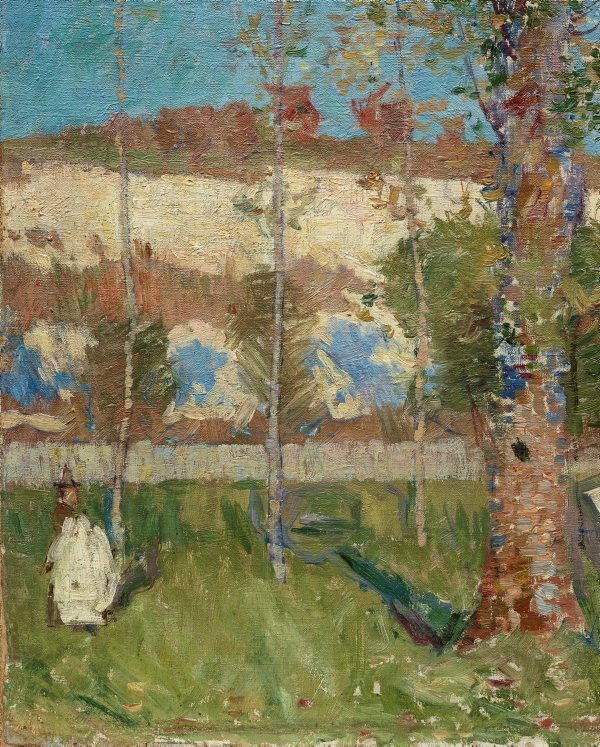 One of the most significant expatriate Australian artists in fin-de-siècle Europe, Russell first trained in London before moving to Paris in the 1880s to pursue his dream of becoming an artist. There he became interested in the work of the Impressionists, applying their approaches to colour and subject to his own work. In 1887 he spent some time at Moret, a small village south of Paris by the Loing River, where he stayed in a villa next door to the Impressionist painter Alfred Sisley. 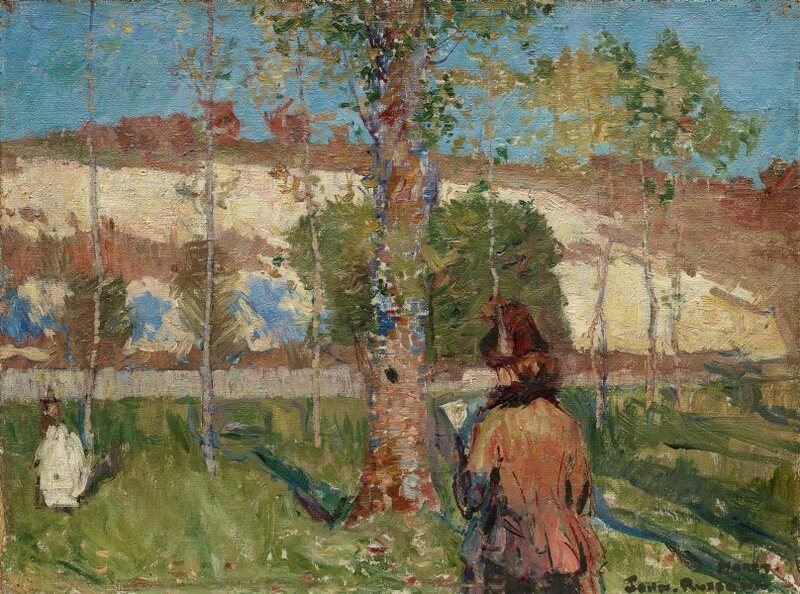 There he made a number of paintings, including this which shows Sisley's wife Marie, painted with the broken brushstrokes and high palette of the Impressionists. Signed l.r., black/green oil "JOHN. RUSSELL". Not dated. Martin Bailey, Apollo: the international art magazine , 'A friend of Van Gogh: Dodge MacKnight and the post-impressionists', pg. 28-34, London, Jul 2007-Aug 2007, 33, 34 (colour illus.). Bruce James, Art Gallery of New South Wales handbook , 'Australian Collection: Painting and Sculpture', pg. 102-181, Sydney, 1999, 109 (colour illus.). Ursula Prunster, Australian art: in the Art Gallery of New South Wales , 'Home and abroad', pg. 73-74, Sydney, 2000, 83 (colour illus. ), 301. 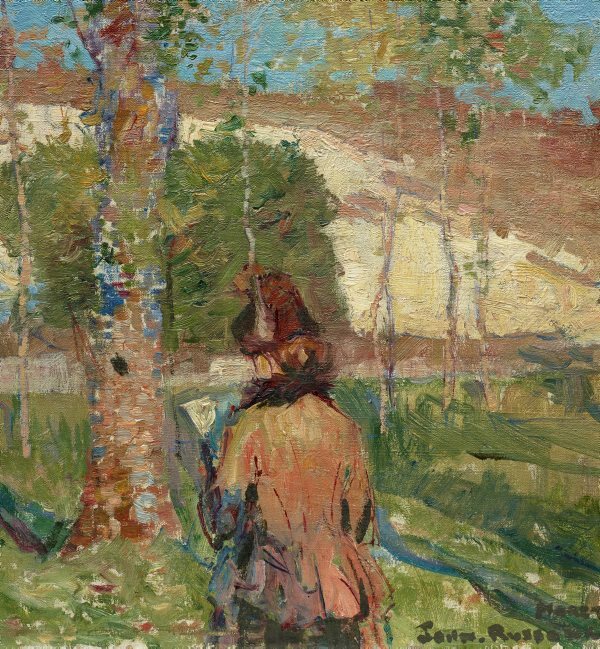 Elena Taylor, Australian impressionists in France , 'John Russell and friends: Roberts, Monet, van Gogh, Matisse, Rodin', pg. 52-70, Melbourne, 2013, 67 (colour illus. ), 169, 175, 176. Wayne Tunnicliffe, Look , 'The lost impressionist', pg. 18-22, Sydney, Aug 2016, 19, 21, 22 (colour illus.). The Lost Impressionist a Biography of John Peter Russell , Sydney, 1976.